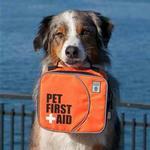 Always be ready on the trail or at home to keep your pet safe with the Pet First Aid Kit by Canine Friendly. The Canine Friendly Pet First Kit was designed to help you assist your pet by reducing their suffering until you can consult your veterinarian. 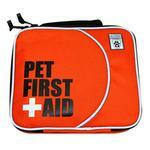 Designed in partnership with Walks 'N' Wags Pet First Aid this kit contains the supplies that you will need for most first response situations. Posted On 04/02/17 by DeAnne K from , NE Yes, DeAnne K recommends this product! 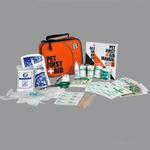 This First Aid Kit has a great supply if items needed for care. Great for each vehicle you travel in to be prepared. Excellent gift for fur babies families. A great thing to have and value packed !!!!!!!! Posted On 01/25/17 by Jen from Philadelphia , PA Yes, Jen recommends this product! Posted On 11/25/14 by Cecilia E from San Diego, CA Yes, Cecilia E recommends this product! It has everything we needed. I didn't need to go to the store. Thanks! I had first ordered small shirts for my Yorkie, but they were too small and too tight. I returned them & ordered medium which are too big (long).